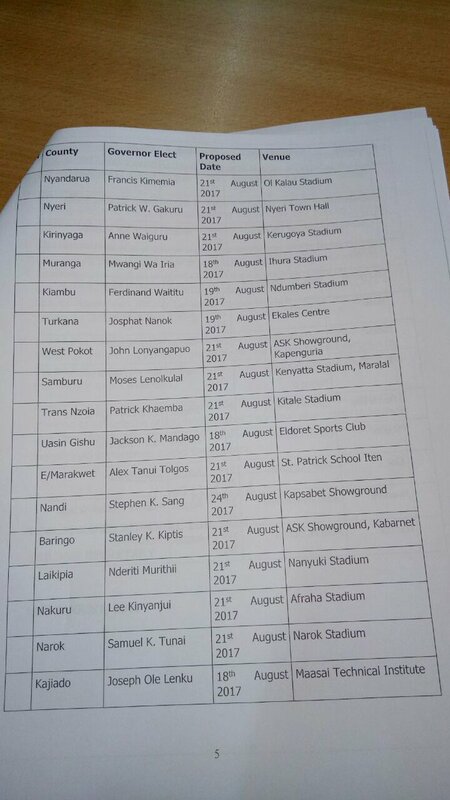 In an announcement by the Cabinet Secretary, Mwangi Kiunjuri, the newly elected governors will be sworn in starting this Thursday, 17 August. As at the time we went to press, 47 Judges and Magistrates have been appointed to preside over the swearing in ceremonies scheduled at each county. 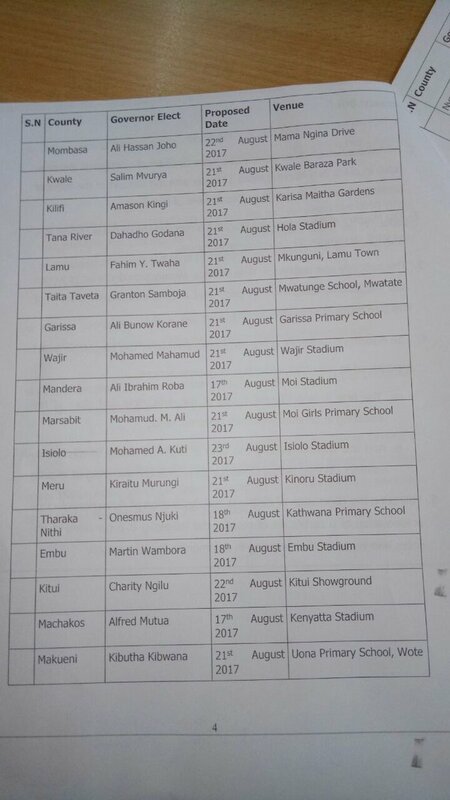 On Tuesday 15 August, Devolution CS Mwangi Kiunjuri said the events have been organized by each county's Assumption of the Office of Governor Committee.The committees were established on July 8. "According to Gazette Notice No. 6409, governors shall be sworn in 10 days after the declaration of election results," the CS said. Lee Kinyanjui, the new Nakuru governor-elect, will be sworn in on Monday at the Afraha Stadium. The event will be presided over by Justice Justus Bwonwonga and Magistrate Godfrey Oduor. Nairobi Governor-elect Mike Sonko will be sworn into office by Justice David Majanja and Magistrate Paul Mulwa at the Uhuru Park grounds next Monday. Kisumu Governor-elect Anyang’ Nyong’o will be sworn in by Justice Dora Chepkwony and Magistrate Julius Ng’ang’a. 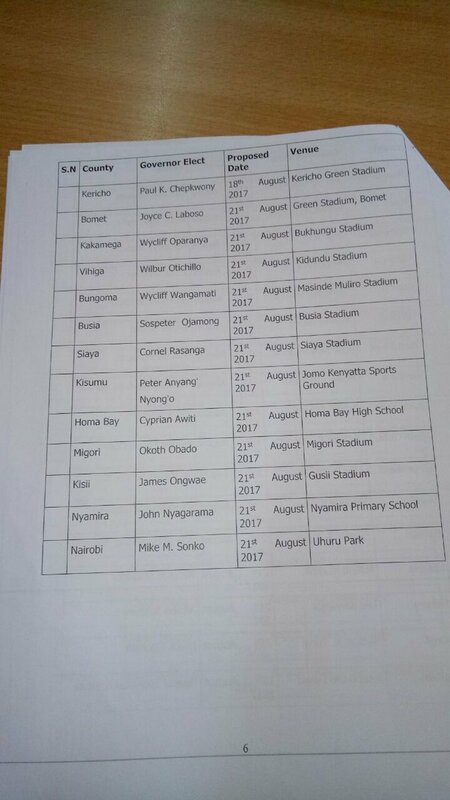 The event will be held at the Jomo Kenyatta sports ground, Kisumu next Monday. In Kwale, the event to swear in Governor-elect Salim Mvurya will be held at Kwale Baraza Park on Monday 21. Kilifi Governor-elect Amason Kingi's swearing in ceremony will be at Larisa Maitha gardens also on Monday 21. The new county bosses are required to be sworn in not earlier than 9 am and not later than 5 pm. Kiunjuri also said outgoing governors will receive send-off packages as per the law. Below is the full list of the schedule.